It's Time to Make the Switch: Speed and Cost Benefits of Switching from PEX to FlowGuard Gold CPVC | Lubrizol Advanced Materials, Inc.
Time is money and as the construction industry continues to get busier around the country, plumbers need to find ways to save both. Unfortunately, in recent years many contractors have been duped by deceptive advertising claims stating that PEX is faster and cheaper than CPVC. While the PEX manufacturers have benefitted from this false perception, plumbers across the country have left thousands of dollars on the table. These might sound like bold statements coming from America’s leading CPVC manufacturer – and you’re justified to wonder how we can back up such daring claims. The great news for you is, you don’t have to take our word for it – you can find the evidence in the words of our competitors and independent 3rd party experts. One of our most prominent competitors, Uponor PEX, published a cost study evaluating a 4-story, 91-unit hotel. Their own cost analysis found that CPVC materials would cost 50% less than their own PEX system. 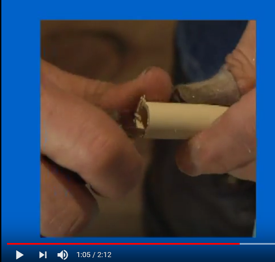 Not only was CPVC the lowest material cost option, but Uponor themselves found that the contractor could save nearly $2500 in material costs by using CPVC in the units. If even our competitors agree that CPVC costs less than PEX from a material standpoint, then the difference must be made up for in labor savings. For many residential projects in the modern construction world, using labor savings to offset higher material costs doesn’t work – because more and more, labor is being paid on a per unit basis rather than hourly. However, for those installers who are lucky enough to pull down an hourly pay or owners who hope to squeeze a few extra units out of a crew each week, installation speed can be an important consideration. We’ve all heard the myth that PEX installs 50% faster than CPVC, but when you peel back the onion and look at the source of these claims, it becomes clear that this is nothing more than deceptive advertising: The CPVC installation uses the wrong tools, including a hacksaw to cut the pipe and a pen knife to deburr it. 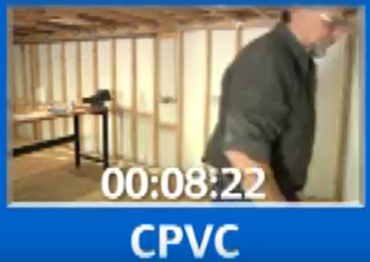 Not to mention the fact that the CPVC installer even walks off camera in the middle of the time lapse. However, simply pointing out the flaws in our competition’s methodology isn’t enough to get to the truth of installation speed. To do that, Lubrizol contacted Home Innovation Research Labs, formerly the NAHB Research Center, to conduct a scientific study of plumbing installation speeds. 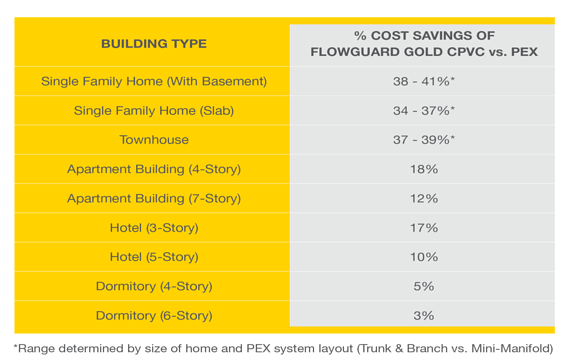 Their study found that when installed in their most common configurations, FlowGuard Gold CPVC actually installs about 15% faster than PEX. The study also found that one of the biggest time saving claims of a PEX system – less fittings – was limited by the fact that PEX fittings took 2-3 times longer to assemble than the comparable CPVC fittings. 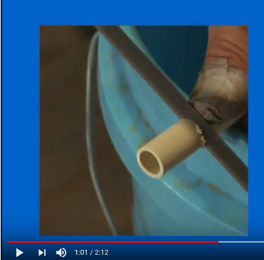 A similar result was uncovered by another PEX manufacturer, SharkBite when they sought to compare their push-fittings to various other methods, including Solvent Welding and Crimp PEX. They found that a CPVC joint could be assembled in 28 seconds while a PEX crimp joint took 49 seconds to assemble. 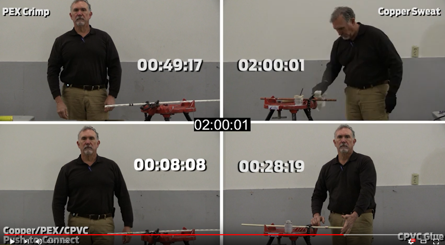 In a separate video comparison, SharkBite found that PEX Expansion joints took about 1 minute 32 seconds to assemble vs. 49 seconds for PEX crimp. 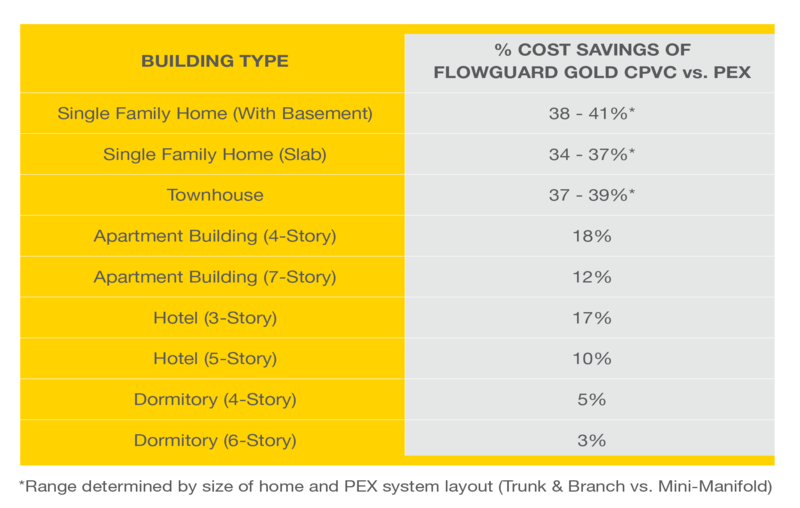 We’ve looked at material costs and we’ve looked at installation speed and in both cases, you need only look to the PEX manufacturers to tell you that FlowGuard Gold CPVC is the lower cost, faster solution for plumbers. These results aren’t at all unusual. Lubrizol contacted a professional plumbing estimator who analyzed a variety of different building types and plumbing configurations and found that FlowGuard Gold CPVC consistently demonstrated lower total installation costs than PEX. When adding up the evidence, it becomes clear that all you have to do is ask our competition and – if they’re being honest with you – they’ll tell you that FlowGuard Gold CPVC offers contractors the lowest material costs and a fast, easy installation that can save you thousands of dollars. As a plumbing contractor, every dollar of material cost and minute on the job goes straight to your bottom line. It’s time to learn how to improve your profitability by switching to FlowGuard Gold CPVC. But what about the switching cost? When you first switched from copper to PEX, you were on the hook for thousands of dollars in special tools and equipment to equip your crews to handle just one brand of PEX. If you needed to work with multiple brands of PEX, those costs were likely significantly higher. The great news when switching to FlowGuard Gold CPVC is that there are no proprietary, special tools required. For new installations, your crews need only a ratchet cutter and a chamfering tool – items that if they don’t already have, cost less than $100 at most supply houses. The choice is clear: It's time to ditch PEX and make the switch to FlowGuard Gold CPVC Plumbing Systems.